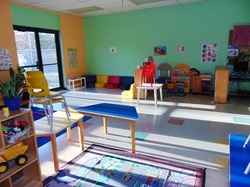 The Pre-School Program at Centre du Sablon offers a unique program that caters to children 2, 3 and 4 years of age. We offer a fully bilingual educational experience to prepare your child for School and that aims to foster the development and potential of every child. Every child will have access to our fun outdoor playground, wonderful library, adventurous mini-gym, self-expressive music & movement room, animated pool time (offered to the 3 & 4 year olds only), large gymnasium and milk program. In this environment we are able to help you child develop in five key skill areas: Physical skills, Social skills, Emotional skills, Language skills and Cognitive skills. Safe & friendly ''class pet'' in every class room! interactive fun! Your child will experience the gross motor benefits of the mini gym, music and movement activities in the dance studio and different play centers in our classroom (sand and water tables, interactive toys, class activities and arts and crafts). Our special needs social skills group is led within an interactive, safe and inclusive environment. All lessons are based on common group needs and goals, and are taught through activities such as cooking, cooperative games, cooking, baking, and basic childhood games. Approaches which help to better teach skills include role playing, video modeling, social stories, behavior charts, I-statements, positive reinforcement, guided learning, praise, step-by-step instruction, visuals and much more! Courses are taught by experienced professionals.